As the days grow shorter and the nights get colder, the grizzly bears around Yellowstone National Park eat with single-minded purpose. They raid squirrels’ caches and chomp down on whole pinecones to find whitebark pine seeds that will fatten them up for the winter. If they are lucky, they consume half their calories for the year in the month before they hibernate. Luck and food have become harder to come by as warmer winters have thrown the Greater Yellowstone ecosystem out of balance. The bears have had to range closer to human settlements to hit their 20,000-calories-a-day target. As summer slid into fall this year, a new threat loomed just over the invisible park boundary in Wyoming’s backcountry. For the first time in more than four decades, hunters were being granted permits to kill grizzly bears. In 2017, the Trump administration removed Yellowstone’s grizzly bears from the federal list of “threatened species” under the Endangered Species Act. Within a year of the decision, Wyoming and Idaho announced that they would hold trophy hunts, allowing the killing of bears outside the park. The only thing standing in the way was a pending legal challenge to the delisting decision and the hunt. A court in Montana would hear the case on Aug. 30, 2018. If the legal team that included Earthjustice failed to convince the judge, the shooting of Yellowstone’s grizzly bears would begin just two days later. 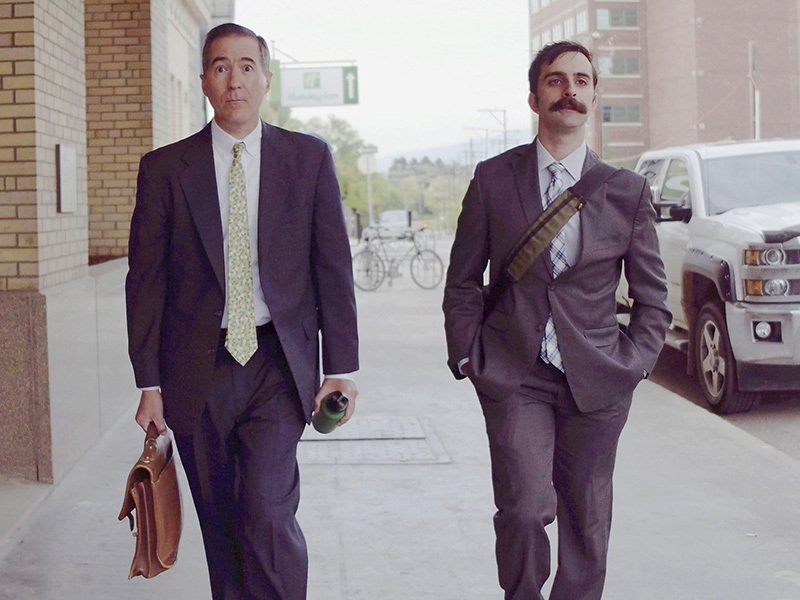 Earthjustice attorneys Tim Preso and Josh Purtle walking to the Russell Smith Courthouse in Missoula, Mont., on Aug. 30, 2018 — the day of the hearing. The long-term fate of the species could come down to this moment. In downtown Missoula, crowds walked to the courthouse on sidewalks stenciled with bear tracks and past shop windows with “Go Griz!” signs. These usual expressions of hometown pride in the University of Montana’s football team seemed, on the morning of the hearing, to be cheering on another Team Griz. People chatted about whether Judge Dana L. Christensen would rule from the bench. Decisions on the day of a hearing are rare, but with the hunt looming, there was an impetus for him to decide quickly. Veteran attorney Tim Preso expected the buzz around this high-profile case, but even his years of experience didn’t quiet his nerves. Preso has been working at Earthjustice’s Northern Rockies office since 2000, and now heads it as managing attorney. He has devoted his life to defending some of America’s wildest places. And protecting the grizzly population around Yellowstone National Park has been one of the key objectives of the Northern Rockies Office since it was founded 25 years ago. When the U.S. Fish and Wildlife Service delisted Yellowstone’s grizzlies, 12 groups, five tribes, and several individuals filed lawsuits opposing the decision. The court consolidated the six different cases into one, and the hearing would address all the parties’ claims. 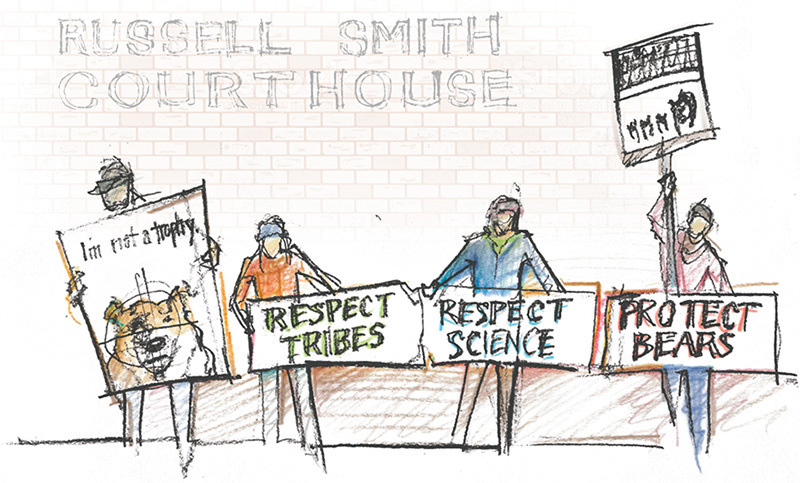 Preso was in Missoula to argue on behalf of the Northern Cheyenne Tribe, Sierra Club, Center for Biological Diversity, and National Parks Conservation Association. On the government’s side, Department of Justice (DOJ) attorneys were supported by intervenors including the states of Wyoming, Idaho, and Montana, along with hunting groups and the National Rifle Association. Earthjustice Attorney Tim Preso explains the legal issues at stake, on the eve of the court hearing and scheduled trophy hunts. Earthjustice’s attorneys now knew they would need to seek a temporary restraining order to stop the hunt. In Preso’s time at Earthjustice, he has only had a handful of such requests granted. Climate change has been difficult for most creatures, but beneficial for the pine beetle. Warmer winters have allowed for the proliferation of pine beetle infestations at high elevations. After several of the hottest winters on record, more than 75 percent of the Yellowstone region’s whitebark pine trees are gone — and so are their fatty seeds. So grizzly bears in search of food come down from the mountains to locations where they are more likely to encounter humans. Many such encounters have resulted in dead bears. In his argument, Preso focused on this link between the rising rate of “conflict mortality” events and the climate change-induced die-off of whitebark pine. In 2015, people killed 45 bears in these conflict mortality events. As a result, the U.S. Fish and Wildlife Service’s own estimate of the Yellowstone population dropped from 757 in 2014 to 695 in 2016. This year has been the deadliest year for Yellowstone’s grizzlies since they gained protected status. The hunt set to take place in two days would add up to 23 bears to the body count, a number that together with the rising rate of conflict mortalities could push the population into a downward spiral. Preso also challenged the Trump administration’s decision to carve out the Greater Yellowstone ecosystem’s population of grizzlies from the rest of the grizzly bears in the lower 48. The government never addressed what this would mean for the conservation status of grizzlies beyond the Yellowstone ecosystem. Without the Yellowstone bears, Preso argued, the government was leaving the rest of the lower 48 bears vulnerable to losing their protected status as well. 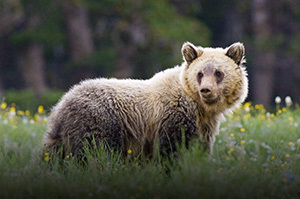 Grizzly bear populations in the lower 48 remain fragile and disconnected from larger habitat areas in Canada. The proposed hunting of bears in Wyoming and Idaho would have threatened efforts to allow bears to expand into regions that could connect the bear populations and put them on a stronger footing. 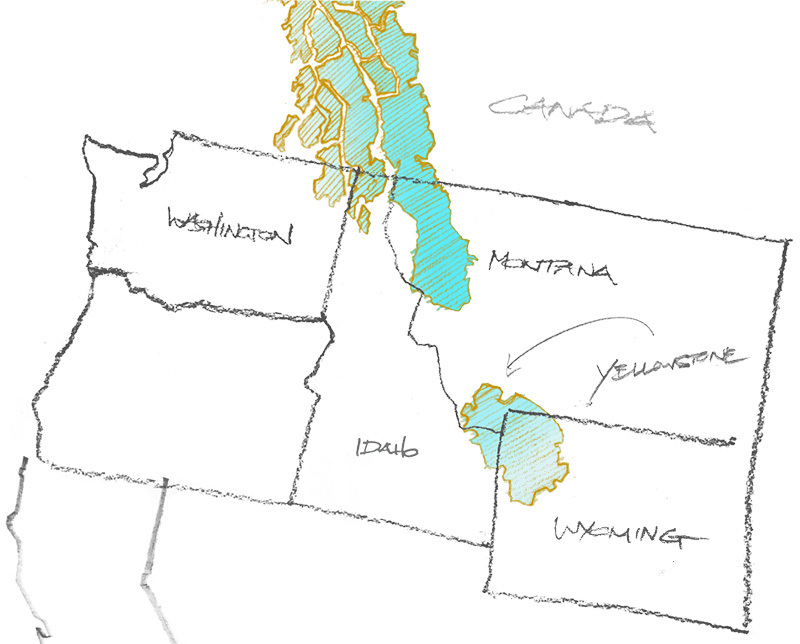 Judge Christensen noted that when grizzlies were first added to the endangered species list, government scientists had declared that for recovery to be successful, different populations of grizzly bears would need to expand in multiple geographies, not just in a single location like Yellowstone. 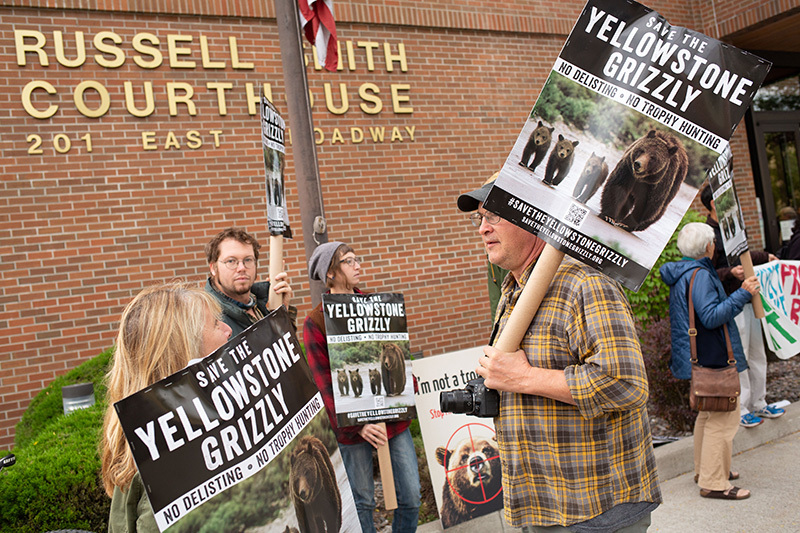 Echoing Preso’s argument, he prodded the federal attorney to answer whether the carve-out of the Yellowstone population ran afoul of the original intent of the grizzly listing decision. “When [U.S. Fish and Wildlife] created the distinct population segment in 2017, did they take into consideration the impact on the remnant?” Judge Christensen asked. Coby Howell, the attorney for the U.S. Fish and Wildlife Service, insisted the government had fully accounted for and would protect the remnant population. 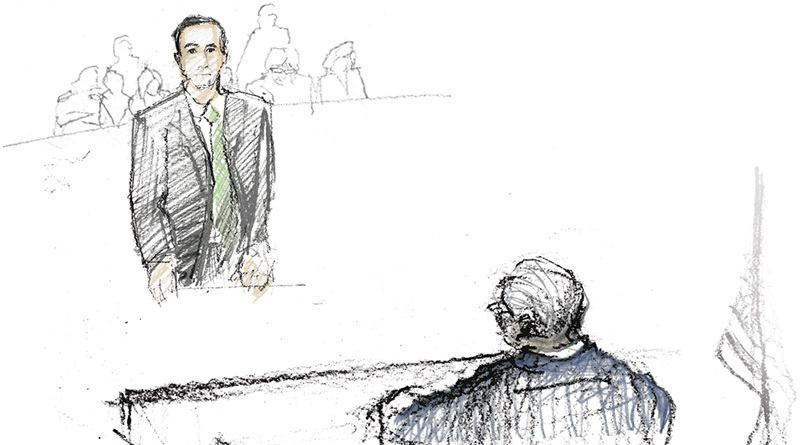 “You’ve got a more clear crystal ball than I have,” Judge Christensen said. Laying out their case, lawyers for the states and hunting groups raised the specter of bears as vicious predators for humans. This claim plays on base fears that are quite exaggerated. The chance of getting injured by a grizzly while visiting Yellowstone National Park is estimated at 1 in 2.7 million. Pushing back on Preso’s argument that conflicts with humans were thinning the grizzlies’ numbers, DOJ attorney Michael Eitel said that the grizzlies’ range had expanded nearly 60 percent over 10 years, and claimed that the increase in bear deaths was due to an increase in bear population density. When the defendants finished their arguments, Judge Christensen, noting that most lawyers were targeting Preso’s argument, called him alone to give a rebuttal for the plaintiffs. Preso first dug into the judge’s inquiry about whether grizzlies outside Yellowstone would remain protected under the Endangered Species Act if the park’s bears were delisted. He argued that the government was still failing to answer this question. He also pushed back on the claim about population density being a factor in the rising bear death toll. Scientists estimate the population of grizzlies has remained relatively stable since 2002. At the same time, the government noted a nearly 60 percent range expansion. That suggests population density is declining, ruling out overcrowding as a cause of bear deaths. At 1 p.m., Judge Christensen adjourned the court without offering a decision. Citizens gathered outside of the courthouse. A crowd pooled out onto the sidewalk. William Walksalong, a member of the Northern Cheyenne Tribe, thought the lawyers argued well for the grizzlies, but he remained skeptical. Everyone wondered what would happen next. The hunt would begin in 36 hours. Would the hunt go on even while a judge was weighing its legality? The Earthjustice team, which included associate attorney Josh Purtle, answered questions from press and clients on the sidewalk. Purtle felt surprised by the lack of a decision and knew their day was far from over. Preso and Purtle hustled to a donated law office offsite to file their motion asking the judge for a temporary restraining order to stop the hunt. “I felt like we had made the better case, but we couldn’t be sure the judge would want to jump in and block the hunt,” Purtle says. After filing the motion, the Earthjustice team hopped in a car for the three-hour ride back home to Bozeman. Purtle and Preso debriefed the day’s argument. They felt confident in the strength of their arguments, but there was no way to tell how the judge would decide. “Usually you leave a hearing and it’s a big relief because you don’t have to worry about the outcome for a few months. But in this case, there was no coming down because we had to put a lot more thought toward what we would have to do in the next few days to prevent this hunt from happening,” Purtle says. At 5:05 p.m., somewhere along Interstate 90, Purtle got an email from the court with an order attached. Preso pulled the rental car over to read the order. The judge granted the motion and delayed the hunt for 14 days. Wyoming would have to contact grizzly hunters on satellite phones and call them out of the backcountry. A video recap of the events in court. 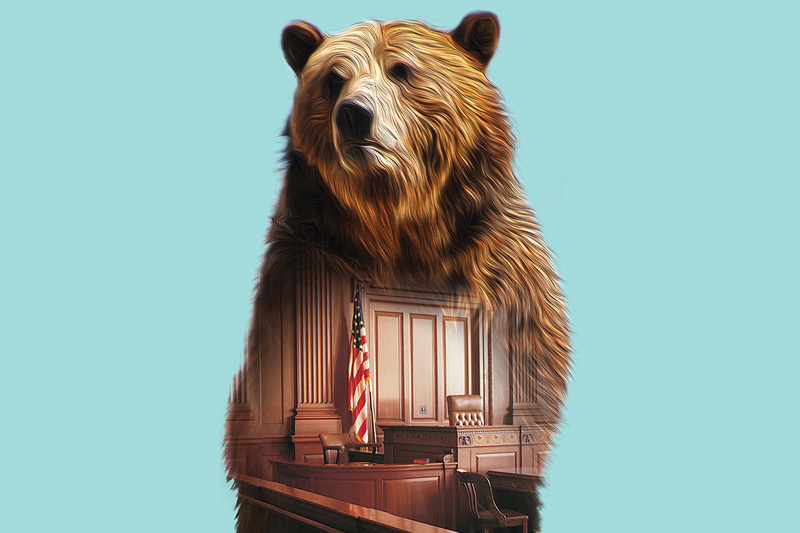 Listen to an audio recording and read the transcripts from “Insider Briefing: Grizzlies Under Fire,” a conversation with Tim Preso, held on Aug. 31, as he explains the outcome of the hearing. The granting of the restraining order felt like a victory, however impermanent. It signaled to the attorneys that the judge had serious reservations about the government’s case. On September 24, Judge Christensen issued his final ruling overturning the government’s decision to delist Yellowstone’s grizzlies. The bears returned to the Endangered Species Act’s threatened list. We represent all of our clients free of charge, thanks to the generous foundations and individuals who believe as we do: The law has the power to make change. 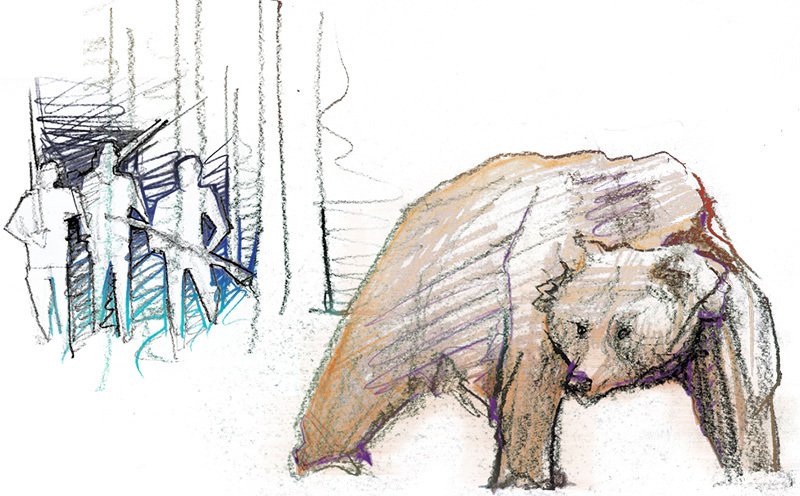 The Legal Fight For Yellowstone’s Grizzly Bears. Previous court filings on this lawsuit can be found in our Library. “We will continue to advocate on behalf of the Yellowstone grizzly bears until the population is recovered, including within the Tribe’s ancestral homeland in Montana and other states,” said Lawrence Killsback, president of the Northern Cheyenne Nation. As for the grizzlies themselves, the threat of a hunt this year has now passed. The Trump administration may still appeal the case. If so, Earthjustice will be ready. A version of this story was originally published in the Earthjustice Quarterly Magazine, Winter 2018 issue. Be the first to read stories like this one and support our work ensuring that our nation’s irreplaceable wild places and wildlife are preserved for future generations, with a tax-deductible investment in Earthjustice. Maggie Caldwell is the National Communications Strategist for the Lands, Wildlife, and Oceans program. She believes that a powerful story told well can change the world for the better. Timothy Preso is the Managing Attorney for the Northern Rockies office. Tim’s docket focuses on forestry, energy, and wildlife issues. He has worked to defend the northern Rocky Mountain region since 2000. Josh Purtle is an Associate Attorney with the Northern Rockies office. Earthjustice’s Northern Rockies Office takes on cases that focus on protecting large, intact ecosystems, and seeks to build ecosystem resilience by reducing pressures caused by oil and gas development, logging, road building, and off-road vehicle traffic.